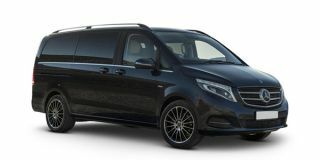 Aesthetically, the Mercedes-Benz V-Class looks like a quintessential MPV with a flair of luxury. A raked van-like front fascia gets a large chrome grille, LED headlamps with LED DRLs. 16/17-inch alloy wheels, sliding doors (electric in the Exclusive Line) add more flair to the design. The Mercedes-Benz V-Class feels like any other car from the company, but gets van-like greenhouse all around - and that natural spacious feel. Belonging to the older generation models, the V-Class interior isn't as tech-laden as the company's newer offerings - like the G-Class. This is not to say the V-Class will feel basic.